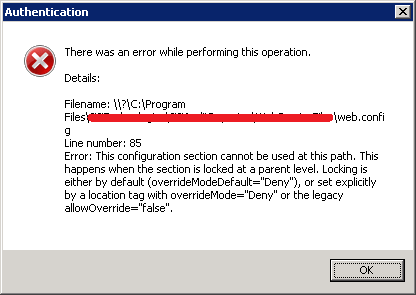 You would get this error when you configure Authentication mode by web config file or programmatically.By default in IIS 7.5 Microsoft has locked down the parent security requiring that you explicitly allow certain permissions to be overridden. I received the following alert in IIS 7.5 when my web.config file had Anonymous Authentication turned disabled and Windows Authentication turned enabled. After hosting my application in IIS, I am getting the below error message. 1.Open the applicationHost.config which is placed in the directory C:\Windows\system32\inetsrv\config\. 2.Look through the xml and change the overrideModeDefault tags from Deny to Allow for the sections overrideModeDefault and windowsAuthentication.